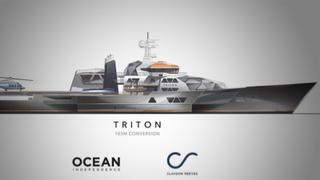 The ex-Royal Navy vessel Triton has been listed as a potential superyacht conversion. 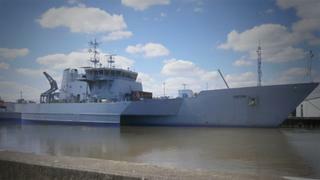 The 98 metre naval vessel, which has most recently served as a survey ship for the Australian Border Patrol, was built in 2000 to naval standards by Vosper Thornycroft and features in-house interior and exterior design. Highlighting her key characteristics as “stability, endurance, relatively high speed and low operating costs,” Ocean Independence said the vessel was suitable for those looking for a superyacht conversion project. “She is ready to be used as she is, or we can offer a bespoke naval architect service to look at converting her to either a superyacht support vessel or a superyacht for those looking for a naval ship appearance and design,” it said in a statement. Accommodation is for a maximum of 48 guests while Triton’s diesel electric propulsion package provides a maximum speed of 16 knots and range of up to 11,400 nautical miles and 40 days endurance.